Shortlisted for CRTC Awards "Housing New Build"
The resulting architecture is far from austere. It is organic, blending natural materials, pleasant architectural forms and technology. Each of the 11 houses is different, and there are accentuated vertical and horizontal architectural elements with sweeping roofs, asymmetrical composition & bay windows etc. to create an architectural narrative which has interest and vitality. To maximize space, all the roofs are of a steep pitch, allowing for rooms within the roof space and 2 of the houses even have 2 stories within the roof space. The resulting varied roofscape adds drama and visual interest. Heights, massing, boundary relationships and the use of traditional building materials all add to the rich tapestry and architectural expression at Abbotts Brook. 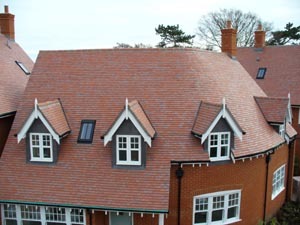 The use of traditional building materials, associated with the Arts and Crafts style was vital if the design was to display a real sense of place and character that is successful. Hard and soft landscaping, bricks and roof tiles all contribute, but with such a prominent roofscape, a poor decision on the choice of tiles would have severely compromised the result. 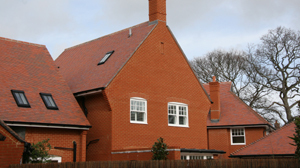 Dean Wells of Canford Roofing said, “my greatest challenge in tiling this development was the curved roof, which was not so much an issue with the tiling but more with laying the battens. I soaked the battens everyday for 4 weeks in order to bend it perfectly; at the top of the roof, it was almost a 90&#176; bend. I used 2 layers of counter battens and I worked in from both sides into the middle of the curve”. On the rear of this curved roof, there are 3 different pitches on the same curved elevation which again presented challenges for Dean. He had to change the direction of the valley a few times. Dean had to cut a lot of tiles to achieve the clean mitred joints. He found the tiles cut extremely well, even with a cruncher. Quantum homes have set out here to create 11 exemplar and innovative family homes. 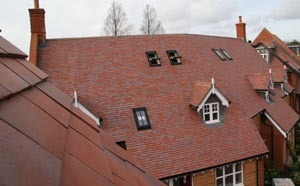 Each house is different and the very varied roofscape adds considerable character and charm to this development which is situated within a highly desirable area of Lymington. The sweeping curved roof and the neatly mitred joints and finely constructed roof detail help to create the sweeping architectural narrative of this quality development. The Quantum Homes architectural designer Gary Warsfold commented that “the use of plain clay tiles was considered vital if the tapestry of materials, how they co-ordinate and add to the whole event was to be successful.” The high density of the development dictates changes of direction in the external walls that are not always at 90 degrees and furthermore changes to the pitch of the rafters. 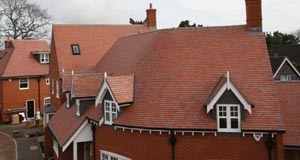 Only plain tiles offer the flexibility to achieve this. 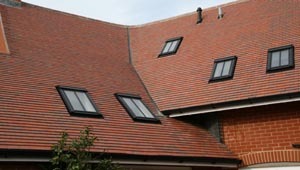 They enable the roof surface to flow from one elevation to another. This is a characteristic that is of increasing benefit, as Government policy calls for increasing development density.